Collect your favorite Marvel heroes as these dynamic figurines available in cool Gacha containers! Each figure features a detailed sculpt of the hero in action. Each figure will require some construction as you attach arms, chest, and legs to the action base. 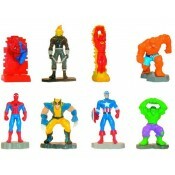 Marvel Heroes Figurine Series 01 - 6 Figures Pack Collect your favorite Marvel heroes as thes..